We would like to make you aware that we are no longer updating the Blog post. Thank you and waiting for you on Facebook! Finalising the Theatre creation "Celebrate Sudan"
2011 getting old, Red Tomato warming up!! And all of a sudden we entered the month of November! Time has flown since we came back to our “duties” after resting the month of Ramadan. And we haven’t even really been able to be Clowns yet! So then what have we been up to? 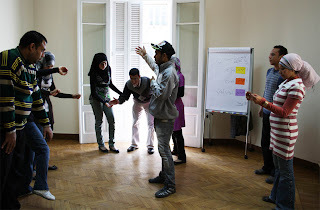 We did a very interesting workshop in cooperation with Médecins du Monde-Egypt. 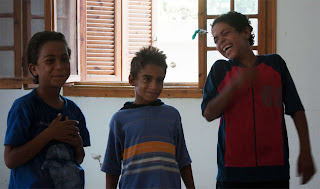 The project was to give drama and pedagogic skills to social workers, and simultaneously make a drama experience to give an opportunity of self-expression to a group of street children and to present their theatre play to audiences. 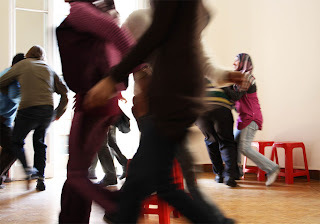 At the same time, the project initiated last spring with Ricerca e Cooperazione has now entered its second phase: the social workers applying their new skills from the drama workshops we taught, to train children in their own NGOs. We are doing field visits and give advice and support. On October 9th, an “open day” for all the children of the NGOs was held. About 100 children met and got to know each other through a day of playing theatre games together. There will be a second such meeting in February. And just in these days we are getting ready to start a training together with CRS (Catholic Relief Services). We will be working with some 20 refugee children from different nationalities to produce a theatre play. The work will be done during November / December. But not all is doing Workshops! On the theatre front we have started the Second year of performing “Going to the Neighbours’ House”, sponsored by Terre des Hommes.. This is a theatre play that was created to raise awareness in Egyptian communities about their neighbours who are refugees. With a cast of five Egyptian actors, and eight refugees from Sudan, Eritrea, Somalia and Iraq, the play aims to raise awareness among Egyptians about refugees living in the country, and to fight stereotypes and suspicion towards the “other”. Through 40 minutes of sharing experiences, stories and song, the play transmits a sense of what is shared between human beings, rather than what separates us. The performance is followed by an open discussion with the audience. This year we have two new actors in the troupe: Mahmoud 13 years old from Cairo, and Emanuel 15 years from South Sudan. We have started rehearsals. The première of the new tour will be on November 20th on World Food Day. Then we will be performing through winter in communities of Cairo, by cooperation with Youth Centres’, Schools, Community organisations etc. It is still only a thought, but … it might happen that preparations are up and running full speed in only two weeks’ time!! To create a theatrical “SOAP OPERA” in seven episodes, tackling the uncertainties and everyday struggles of the poorest of the urban poor of Cairo. The organisers of a series of Psycho Social workshops in some of the most deprived inner city communities of the city have approached us to create this piece of drama… The perspective of doing the exercise is super exiting. We really hope the project comes together practically, and then we GO! We are busy planning this year’s main artistic project for Red Tomato. We are aiming to start creating a new street clown performance towards spring, and then take it on tour through the whole length of the Egyptian Nile, from Alexandria in the north to Aswan in the south, passing by Cairo, Minya, Asiut, Sohag and Qena to get there. The idea of the project is to create a fully interactive street performance. After having always looked for forms to actively participate the audience in our shows, and to be quick to improvise on any initiatives arising from the audiences, our focus is now is to take improvisation a full step forward. To create a show that actually can not be complete without the interaction of the audience. It will be a show that prompts the viewer to act and to interact, not only with the Clowns, but also with each other. But can we sit quiet and spend our time being workshop trainers and project managers?? Are we not going to put on our Red Tomato Noses? We are in these days going back to rehearsals in order to start performing “Yes Chief!” again. The new launch will be on an event organised by a Community Centre in the Medieval, dense, neighbourhood of Cairo, November 15th. 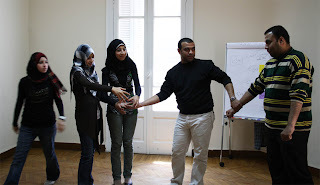 After that we are engaged by CRS to perform in Refugee Community Schools around Cairo. We will do at least 18 performances in this project, going late into February or early March. Yes, welcome, everybody to come check out what we are up to. And welcome with ideas, suggestions or any support. This eventful year is closing in on its end. It has been an overwhealming experience, with great creative spirit and cooperative energy being released with a bang! It is the beginning of something new and positive. Yet, merely a beginning... We have to just fully be in this year to its very last moment. And then start holding our breath for what next year will bring! Meanwhile, the five members of Red Tomato – Aly & Aly, Hany, Diana, Jakob – we just try to keep going with our multi-disciplinary clowning. We are convinced that what we are trying to do is as important now as it ever was. Laughing when times are sad can be a good thing. And apart from laughing, to keep being critical and stimulating creative spirit and independent judgement is essential. And to stay open to the other, choosing dialogue and sharing as the better way to go ahead into the unknown. We believe that the Clown exists in every person! That creativity and imagination are important needs of every human being. That when we liberate our capacities to take creative and imaginary stances to the state of our lives, we can also be more critical and find new ways of seeing things. We do street clown performances, going to all audiences all places. Where ever we go we bring simple everyday objects that we transform in unexpected ways, to music and images. And we transform the spaces themselves into a theatre, where we can share laughter, dancing and stories. We do training in creative group work and drama. We work with children and adults, such as social workers and educators. Through game playing and exercises, we help individuals discover new capacities, and groups work together, to cooperate better, and to share in creative ways, using their own experience, stories, and ideas. Our workshops run through a process that stimulates the active participation of all individuals; to create a sense of trust in which all are able to express themselves freely; to emphasise the importance of listening actively to every one; to respect difference; and to build constructively towards a common goal. Red Tomato premièred the new play "Yes Chief!" on World Refugee Day, for a 500 audience of fore mostly refugee children & adults from different communities. It was a great day. Big audience and high spirits. The children were very eager to participate, storming onto the stage when we invited to dance to our rhythm orchestra. Afterwards, when we left the stage with our "Samba" parade our small group of 4 was more like a sea of performers, the children drumming away on all kinds of objects they creatively found in the space. The event was organised by UNHCR and CRS on Friday 17 June. Place: Saqyat el-Sawi (Culturewheel), 26 of July Street, Zamalek. It is a street theatre piece of clownish play with structures of authoritarian power. Four clowns arrive in a drumming parade, engaging the audience to come see their circus / clown show. They are a group that enjoys playing together. But suddenly one of the clowns starts to behave in an authoritarian way, commanding the others on what to do. The others’ reactions vary: there is the opportunist, the coward, and the critical one. As the show goes on there are attempts at resistance, at negotiation, and … maybe even at staging a coup against the “chief”. Towards the end, what happens?... To find out the conclusion of the events, come see the play yourself! It uses music, clown theatre, and circus techniques. It is suitable for children and all audiences. Members of Red Tomato gave a Training of Trainers workshop called “Drama for self and group understanding and expression”. The work was conducted as a part of international NGO Ricerca e Cooperazione’s project: “Actions for Vulnerable Children Improving Capacities for Enhancing Intervention”. stimulating active listening and the interest in personal experience; providing group animation and creative workshop techniques; providing basic drama tools. After conducting the basic training, the second phase of the project aims at supporting the participant NGOs to set up drama workshops with children in their own organizations. Two groups of social workers have completed their training, and are implementing activities at their NGOs. Red Tomato members are assisting them in their localities. Workshop presentations: In October the first in a series of "open drama days" for and with the children being trained in the NGOs was held. These days serve the children to meet and share with others what they are learning, and what they want to perform. On October 9th some 100 children from different NGOs spent a day getting to know eachother in theatre games workshops. The next meeting will be in February. The beginning of the collective dates to June 2009, when its five founding members met in a street-clown performance project with the Clowns Sans Frontiers, France. All five had previous experience of street theatre and performance. Joining together and continuing work together over a year with clowning, street performance, and giving workshops, led the members to the formulation of the idea of Red Tomato. November 2011 – ongoing: Project “Drama for Self expression and Creativity”. 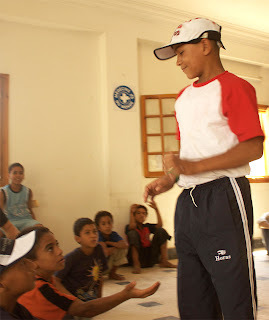 Drama work in Refugee Community Schools in Cairo. Theatre workshop for 20 refugee children from different countries; “Yes chief!” Clown performances in 16 community schools. June 2011- ongoing: Street Clown performance: “Yes chief!” (The premier took place for the World Refugee Day in El-Sawi Culturewheel in front of a 500 capacity audience). February – October 2011: Project "Actions for Vulnerable Children - Improving Capacities for Intervention". Training social workers from 20 local NGOs working with child labourers and street children. Drama and group creativity workshop, and follow up to start implementing drama work in all NGOs. Project Leader: Ricerca e Cooperazione (Italian international NGO). November 2009 – December 2010: Special focus on street-children – cooperation with Clowns Sans Frontiers, Samu Social Egypt, FACE Egypt, National Council for Womanhood & Childhood. Artistic and social interventions for street children in Cairo. Nigh-time performances in localities where street children gather around Cairo; Animation days, game-playing & drama exercises; Performances in “Ahdath” (Juvenile correction institutes) of Cairo & Giza. October 2010: Circus show creation and performance with Circus Shake of Berlin, Germany. Two performances for 1500 audience. Cooperation with Grenzkultur, Germany; The National Circus of Egypt; El-Sawi Culturewheel. 4 & 5 November 2010: Three performances at the Alexandria Farah el-Bahr Mediterranean festival. One street parade show; two Clown/circus performances. Audience approximately 4000. 1 February 2011: Inter-active samba parade performance on Tahrir square, Cairo on the first “March of Millions”. - Clowns Sans Frontiers, Clown Collective, France. - Terre des Hommes, NGO Switzerland/Egypt.